It's About Knitting and Other Stuff...: The Virtues of Wool for Bike Wear, or, Hasn't it Been an Awful Winter? The Virtues of Wool for Bike Wear, or, Hasn't it Been an Awful Winter? I started cycling regularly about three years ago. The campus I work on is either one quite long and one short bus ride away, or a drive to the Park & Ride and then two short bus rides away. This commute isn't only bad for my health - I reckon I put on about a stone when I started in this job, just due to being sat on my bum all day in various places - but also the pocket. The answer to both these problems was to get to work on two wheels, as much as possible. I got my trusty steed - a Specialized VITA hybrid - in May 2010. Until the boy started school I did a 7 mile each way commute, summer, autumn and winter - occasionally I'd haul the bike into the estate car and only do the second half of the trip if the weather was truly, truly awful (howling gales being the most unpleasant). Now - being hostage to school kicking out time - I do about 4 miles from the Park&Ride and back, with the bike lifted up on a rack on the van for transporting home (so much better for the back, and develops biceps!). I've ridden in some horrible weather but this year has been an education - I live near Oxford and we've had floods, persistent below zero conditions, and snow in APRIL. Each time I've felt my ears freeze I wondered why I wasn't fully encased in wool from head to foot (though my feet were, in fact, very warm due to my knitted socks). 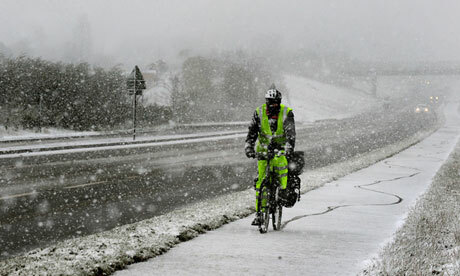 I really like snow when I'm skiing, or indoors knitting (picture: The Guardian). The purchase of a very expensive merino base layer proved to me how synthetics, even the hi-tech breathable ones, really can't keep you as warm and toasty as wool can. Especially when you have a giant hill at each end of your ride. I got a lot of wear out of my many scarves, and whatever cycling friendly jumpers I own (not many, I discovered). One morning I wrapped my giant scarf round me as an improvised mini skirt, and that was super warm. So I was interested to see this post on Carlton Reid's* 'Roads Were Not Built For Cars' about the 'Tweed Run', which was last Saturday (some lovely pictures here of the gracefully attired Tweed-Runners in previous years ) and the Cyclists Touring Club rules about dress in the 19th Century. Until 1907 the Cyclists Touring Club had a uniform which was entirely woollen, no cotton - as we 'modern outdoors people' know, cotton is dreadful stuff for getting sweaty in due to its ability to remain wet for hours - this is one thing synthetics have overcome. The CTC of the late 19th century didn't have access to Gortex and other such things, so they wore wool. They wore wool on top and underneath. There are some smashing pictures in Reid's article of samples of thick woollen cloth, thin woollen cloth and shirting flannel, and of 'pure natural un-dyed wool' (knitted) for use in underwear, as well as the cycling costumes they were tailored into. While I might give the woollen knickers a miss I am planning a more woolly wardrobe for next winter's commute. I'll need a few layers and it'll need to be in non-itchy yarn. It'll also and fit me nicely, which should be no problem now I know some knitting maths and how to freestyle a bit. Even if I have to knit most of it myself, I'm determined to be a bit warmer on my rides when winter comes around again. I've got the socks already after all. *His is a whole Kickstarter funded book writing project about how roads were not built for cars, with a great website to go alongside it. Well worth a pootle round.